A snapshot of the proposals to improve N-Judah service at Ninth and Irving. See all of the proposals on ##http://sfmta.com/calendar/meetings/irving-street-streetscape-changes-presentation-open-house##the SFMTA website##. When it comes to gauging support for changes on our streets, it’s easy to get the impression at community meetings that a handful of vocal critics represent significant opposition. But as preliminary survey results from a recent Inner Sunset meeting on improvements for the N-Judah show, public forums can often be a poor reflection of the actual level of community support for re-allocating street space to improve transit, walking, and biking. At a meeting about the N-Judah two weeks ago, planners for the Transit Effectiveness Project fielded input on route adjustments and other measures to speed up Muni service, like transit bulbs, new transit-priority traffic signals, and stop consolidation. Having attended most of the SFMTA’s community planning meetings over the past three years, I’ve noticed a strong pattern: While a handful of people may scream about project proposals in a public forum, that doesn’t mean they represent their neighbors. During the Q&A portion of the N-Judah meeting, the usual dynamic played out. Complainers dominated. Fear of change seemed to permeate the room. But in the survey filled out by people at the same meeting, most respondents supported the boldest proposals [PDF]. Actual public sentiment was in favor of change. The pro-reform contingent was just less vocal during the Q&A. Not that planning decisions that make streets safer and improve service for thousands of transit riders should come down to a vote. But too often, city agencies cave to the loudest people in the room and water down proposals in a misguided bid to appease critics. The N-Judah meeting showed that the angry people may command the most attention, but that doesn’t mean they’re representative of public sentiment. Take the Polk Street redesign, which the SFMTA watered down last year to appease merchants who fiercely oppose any removal of parking for protected bike lanes and sidewalk extensions. As it turns out, a recent survey of people who live, work and shop on Polk showed that safety for people walking and biking is a far greater concern than the supply of car storage. Even on that last item, the bolder option (transit stops with a bike lane between the sidewalk and boarding island — similar to the configuration at Duboce Avenue and Church Street) was favored by a narrow majority. It’s still a pretty new arrangement to SF, and some people are still uneasy about crossing a bike lane (even though we have plenty of boarding islands where we must cross traffic lanes for cars). But since Irving is the most practical bike route through the neighborhood, and where the businesses are, it’s crucial to implement this design, or else people on bikes would be forced to ride on the rail tracks. The issue didn’t come up in the Q&A session. Now, to address a few of the concerns that did come up during the Q&A. One woman insisted that the proposed sidewalk extensions would somehow add to traffic congestion, even though the space would come from parking spaces and excess road width mostly used for double parking. One man, of course, complained about the loss of 30 parking spaces for the benefit of tens of thousands of N-Judah riders. Another woman who lives on Irving between 5th and 6th Avenues, where the new consolidated N stops would be, said she feared noise from waiting Muni riders. But any such problems would already exist at the stops one block over, and they’re pretty quiet. Fortunately, the SFMTA, DPW, and Planning Department do seem to be taking more surveys and moving away from meetings structured mainly around Q&As, which tend to get co-opted by whoever can take the floor the longest, often voicing irrational or irrelevant comments. The format of the N-Judah meeting was an open house with boards and staffers explaining the proposals and fielding questions and comments, with a presentation and limited Q&A session in the middle. It’s important to keep in mind that the format of those Q&A sessions is biased toward opposition. City staffers usually set it aside for clarifying questions, but more often than not, it’s an opportunity for critics to get on a soapbox. Meanwhile, as the N-Judah surveys show, supporters of the proposals tend to stay quiet as they wait for the meeting to move along. As you attend the Muni TEP meetings (and public planning meetings) going forward, it’s important not to let your impression of community support be based on whoever’s yelling the loudest, and, of course, take the surveys. The SFMTA’s survey about the N-Judah Irving improvements is still open online. And the TEP meetings are just getting started. Below is the schedule for the rest of the round. ≈ But … but … I have an online petition! No fair surveying people. It seems the point of this article is that if the process doesn’t result in a favorable outcome, then change the process (Not really different from voter intimidation tactics). This time you got a friendly staff that you don’t have to bargain with, but what about other places that you get a bad plan. Do you want to go through a public process that you essentially get ignored? I’ve been plenty of those. Part of the process is to hear from people that who have concerns and who don’t like the plan for whatever reason. This is the opportunity to make whatever changes to address their concerns, and/or come with a very good case why they are wrong, and let the policy makers (politicians) to make a judgement call. A bad public outreach progress encourage opposition folks to politicize the issue which can lead to bad outcomes (like putting the issue on the ballot and got voted down). See HSR and how that turned out. If you think that there’s public support that isn’t represented, there should be more public outreach rather than less. in my day job, when we ask people to identify strengths and weaknesses of a brand, they easily identify twice as many weaknesses as strengths. Once we discuss the weaknesses in a rational manner, they often realize they’re not nearly as influential as the strengths. The problem in these public meetings is that there’s no strong process for imposing rational discussion on any perceived weaknesses, only shouting about “rights,” insults to the planners’ professionalism, and veiled threats about what will happen to politicians who don’t tow the nattering nabobs of negativism’s line. No wonder we get watered-down proposals like Polk Street, when in reality we should have bulb-outs, off-street parking, separated cycle tracks, and Dutch-style junctions as the default configuration. There’s just no real argument against such measures. I think the one thing to remember is that the people who scream the loudest and act like spoiled children screaming about how changes are bad tend to be people with a lot of time on their hands. Those who have jobs, families, and other responsibilities can’t always show up at a meeting but can express their views without acting like a baboon through other means. Also, the loud shouties are usually upset about these things not because of the merits, but because they represent an old way of thinking that usually includes racist and classist assumptions about “transit” that belong in the Olden Days. also similar changes were made in Cole Valley and guess what? it is not a zone of dead businesses, a new “Fort Apache/The Bronx” instead it is thriving and people can board faster and the train moves along and everything is OK despite what the whiners said back then. This just means that planners are inept at running meetings. I was at a meeting about making changes to Glen Park that was seriously factionalized between tree people, dog people and native plant people, each of whom was prepared to defend their pet issue to the death; but we had a professional facilitator who was AMAZING. He kept it from devolving into a shouting match. Everyone felt that their viewpoint had been heard and the changes went forward. doubtful of success, nor more dangerous to manage than a new system. those who gain by the new ones. Good point. But a public meeting should not have to have an amazing facilitator in order for a city department to gather relevant input. If SFMTA, for instance, had held both meetings (with noisy protesters) and done surveys of Polk users/residents’ desires (expressed in private), the department could have understood the noisy merchants’ views as relevant but in still in the minority. As it was, the department head (Reiskin) caved and looked shocked when confronting merchant anger. Emotions of a minority derailed an excellent plan favored by the majority. Perhaps we are all learning that public meetings are just one piece of the outreach puzzle. Good post Aaron. It’s a good trend that SFMTA, DPW, and the planning department are doing more surveys. As has been mentioned, not everyone feels comfortable speaking up in meetings, especially if an obnoxious neighbor has a contradictory opinion. Others are just shy, can’t get a word in edgewise, or fear public speaking. Giving people a variety of ways to provide feedback will generate better feedback. That said, I wouldn’t eliminate Q and A altogether, but it does need to be managed. You cannot let a few crazy or rambling people dominate. One meeting I attended had people write their questions down on a piece of paper and then pass it up to a facilitator who asked the questions. It worked very well as the questions were more to the point, no one was embarassed to ask a question, and we got far more answers in the time alloted that way. I once did a telephone survey about housing in California, then they asked a few of us to a 2-day workshop for housing in the future. There were presentations as well as small group discussions. This gave me a much better understanding of all the options and challenges. I LOVE the transit islands adjacent to the bicycle lane. Everybody gets their space- people waiting for the bus, people on bicycles, and people walking. Yesterday, I tried bike share from the caltrain station yesterday and ended up walking the bike on the sidewalk for a block from the station to avoid having to dodge three buses. Having to maneuver around huge vehicles on a bicycle makes me profoundly uncomfortable. It’s one reason that I do not believe that SF is as bicycle friendly as it claims to be, not yet anyway. Will there be room on the transit island for a bench or two? With a huge park nearby with lovely benches and views, I cannot see many people wanting to hang out on a bench near a bus stop unless they were waiting for a bus. When in Amsterdam recently, there were many similar situations where you had to look for bicycles when crossing the path. Everyone once in a while, I got distracted and forgot to look, a “polite” ring of a bell was enough to wake me up to get out of the way. It wasn’t that difficult to get used to it. Were there public outreach and consultation when cities built freeways and other urban renewal projects in 50s and 60s? Even though political attitude has changed somewhat in the US and other developed countries it isn’t there in the developing world like China. Any government who is proposing such changes has disproportionately more power than regular citizens. Remember we live in a democracy, not a society of planners with certain ideas. Part of the planning process is to sell the ideas to the public and gain public acceptance, not just applying some concepts. Whether people are screaming or not (and I deplore the ones who keep others from being heard as much as the next guy), there are any number of reasons people can’t show up at meetings and some may not even hear about the survey. And does everyone supposedly have an equal voice? Does it matter whether you are a resident with a car but no garage (parking issues), a cyclist, a Muni rider transiting the neighborhood vs. one who lives where the changes are to be made, someone commuting to work in the ‘hood, etc. etc. Everyone’s point of view is colored by their personal needs. There’s no magic bullet, although he does note that some prediction biases can be corrected by informing people about how surrogates have *actually* felt in similar situations. In planning, you do see this in some community workshop-type events, although it often runs up against our innate sense of uniqueness (“Sure, that bike lane works in Portland, but San Francisco is different!! !” etc.). We probably need to have a general discussion on the appropriateness of having bicycles on sidewalks. Many people oppose this. Why has SFTMA all of a sudden decided that it is ok? Really? Got any facts to back up your assertions or are you just demonizing the opposition? In any event, I suggest thay you not be so cavalier about playing the race card. The presence of a neutral person running the meeting really helped. By contrast, at SFMTA meetings the meeting is conducted by the agency proposing the change, Opponents feel as if the deck is stacked against them, so they act out. Can MTA put one more streetcar on the N Judah route? What is the cost difference of having another streetcar in comparison to all the new improvements? MTA engineers, planners simply said “we don’t know” to the questions. People cannot support a plan when MTA is obscuring the answers. The more people look at the proposals, the more problems they’ll see. For ex. MTA will consolidate two streetcar stops into one new stop. That means twice as many people boarding/exiting at one stop than at two streetcar stops. Net travel time gain is zero. Passengers feel safer to board/exit the streetcar from the sidewalk. The bicycle lane would make it much worse for passengers. What do you mean by ‘adding another streetcar in comparison to the new improvements’? Do you mean having another streetcar headway or having a three car train? Why does the answer from the SFMTA, “I don’t know” represent obscuring the answers? You make it sound like they are deliberately withholding information, when in fact they might not have an answer for you in that forum. You appear to misunderstand the travel benefits by stop consolidation. It has to do with the amount of time it takes to the train to decelerate, stop, take on passengers, and accelerate. It’s not only based on the number of passengers that get off and on. The SFMTA has real data that shows stop consolidation decreases travel times for transit lines on other lines. Review what has happened on the 5 since the stop consolidation that took place there. Please explain why “the bicycle lane would make it much worse for passengers” then the current condition, existing adjacent to parked cars. I would like to point out that option two, the one that forces people on bikes to ride into the streetcar ROW is extremely dangerous for them, as it creates conflicts for people on bikes and with cars. Not to mention it increases the risk for cyclists who have to cross tracks twice. This will ironically make conditions for those walking worse as it will increase the number of cyclists who will take to the sidewalk as that would be the only safe option at those locations. Frankly, I am fed up with people who have this bias against ‘bikers’ because the perception is the represent a greater danger than cars. The fact of the matter is that no bicyclists will deliberately run into a pedestrian as it represents just as much a risk for injury for the person on the bicycle as the person walking. In addition, the speeds that bicyclist travel adjacent to pedestrian islands is between 10-15 mph, not the 20-30 mph that most car drivers race past them on Irving. And getting rid of parked cars will be safer for passengers exiting from the trains than keeping a line cars that passengers have to filter through to get to the sidewalk. It goes beyond reading comprehension, Sebra here can’t seem to follow along even when the SFMTA provides renderings. @acnetj:disqus if I thought planners were on my side, I wouldn’t need to attend those meetings. What I said, _not what you tried to make me say_, is that generally speaking we know from real-world examples how to build a street that works for everyone, yet the planning process as we have it allows people with no planning experience to influence the core structure of those streets so that they continue to work _badly_ for everyone. It would be as if automotive engineers allowed customers to tell them how to build engines and transmissions, instead of just allowing them to choose the color of the paint and the upholstery. In her defense, the rendering with the bike lane does show the lane going up onto and over the sidewalk (surrounded by yellow ramps). That configuration does seem new to me, though I’m not opposed to the idea. Take a closer look: the green lane is shown with curbs on either side and there wouldn’t be ramps if it were already at sidewalk level. The mid-block crossing with ramps is an improvement over the Duboce & Church stop where there is only a single ramp/crossing at Church, with no accessible ramp either mid-platform or at the far end. 50 years ago planners told us we needed freeways, and lots of them in San Francisco. It was a popular revolt–by people with no planning experience–that stopped them. I think you are demonstrating the logical fallacy of argument from authority. Just because someone has some letters after his or her name does not necessarily make that person right. I know that. I’m saying she’s right that one of the SFMTA plans does have bicycles going onto the sidewalk. My assertion is that things like bulb-outs, raised crosswalks, separated cycle tracks, Dutch junctions, etc., have proven their worth and should be the default. Why do we have to fight for them at each and every meeting? I know why – because those same forces that tried to ram freeways down our throats are still at work today, prioritizing the speed and free movement of private automobiles even though the costs of such policies are clear. nice post. As a practicing planner, I would be really excited to see streetsblog cover a series on diverse public engagement approaches – both on and off line. A lot of what works and what doesn’t work is subjective. If part of plan is to encourage or force people to change behavior, then people can certainly question that if they don’t intend to change behavior. Part of the planner’s job is to listen to these folks, understand their concerns and come up with options or a really strong explanation. While people buying cars don’t get to pick an engine or transmission like exterior color, the marketing and engineering folks conduct a lot of market research to find what the customers want in terms of handling and performance, and then construct an engine that would meet those needs. If they don’t do that, then these cars will get bad reviews and result in poor sales. They only have proven their worth mostly in Europe where social policies and attitudes are different. If you don’t think they are different, then ask them about things like gun control. People outside the US don’t understand why Americans are so obsessed with guns. At least in this case the issue isn’t so black and white so there’s a lot of opportunity for learning, dialogue, and compromises. Some opponents like to turn it into a wedge issue (like abortion, gun control, and most recently healthcare) and this should never be a wedge issue. If it does you may get everything you want on some SF streets but lose everything in other places. No. Maybe the silent majority of people who still need to use a car at times are starting to speak out. For the longest time, it was the anti-car progressive advocates screaming out loud and demonizing anyone not like them just because they own/need to use a car. Now these silent majority are fed up and are now speaking out. It’s incredible that once the tables turn against the progressives, they start demonizing the people who are giving them a dose of their own medicine. Pretty hypocritical. Was the option for a bike lane on the sidewalk one presented in the meeting, but not posted online? From the documents on the SFMTA site I did not see any option for a bike lane on the sidewalk, only the option to place a cycletrack between the platform and the rest of the sidewalk. The presentation document did include the Duboce Avenue cycletrack as an example. Dude, you’re totally missing my point, which was never meant to be complicated or controversial. Are you trolling me? For the third time, the rendering with the transit island shows the street-level bicycle lane going up onto the sidewalk-level for five feet or so, using the yellow ramps in the middle as I said in my first post. I wasn’t saying the lane is part of the sidewalk. It crosses onto and over the sidewalk, so bicycles will be on the sidewalk, but only for a very short amount of time. Costs, too. Outreach takes time and money. The resources required for one more opportunity for irate individuals to argue with experts could instead be used to actually implement a safety improvement that saves a life. – For ex. the streetcar runs every 30 min. Adding another separate 1 or 2 car streetcar could make them run every 20 min. When the question was asked MTA planners, engineers could have said: No that is not possible because of … ; or Yes we can look into that. MTA’s job is public transit. When the planners, engineers cannot answer a question about transit, what do they know? – valid point. For ex. it might take 6 seconds to decelerate, 6 seconds to accelerate at a stop. Consolidating two stops into one will reduce travel time by 12 seconds. MTA claims they’ll reduce travel time by 90 seconds. Where will they reduce the remaining 90-12=78 seconds of travel time? – could you please provide the data of consolidating stops on streetcar lines? – Lots of drivers stop at the very last second behind a streetcar to let passengers on/off. Few drivers don’t stop at all and injure passengers. With the 29 ft wide extended sidewalk passengers will board/exit the streetcar from the sidewalk and don’t have to worry about oncoming cars. With the bicycle lane passengers would still have to lookout for oncoming bicyclists before reaching the sidewalk. Do you think 2 streetcars of passengers are going to walk to the ramp to get to the sidewalk? You also admit getting rid of parked cars will be safer for passengers. So what is the issue? – Misconception. MTA is not forcing the bicyclists onto the streetcar rails. I apologize, I mistook your meaning. With the bicycle lane passengers would still have to lookout for oncoming bicyclists before reaching the sidewalk. – At last week’s meeting you said we don’t need a bike lane because nobody uses them. Sorry murphstahoe I believe you are imagining things. Which meeting are you talking about? When calculating the duration of time required for a transit stop, the time needed for the opening and closing of doors and for the safe departure from the stop (as well as for passengers to ascend and descend the steps, tag on/pay the fare) adds up. 90 seconds for a fairly busy light rail stop seems reasonable. N judah runs every 5 to 10 minutes on the weekdays for most of the day. Increasing the frequency even further would not decrease the duration of a trip on the streetcar. 45 seconds to accelerate or decelerate (is that a word?) does not seem unreasonable to me. What evidence is there that these particular street cars are able to stop and start faster than that? 90 seconds may not seem like much time to save, but I am assuming that this is not the only stop consolidation. Saving 90 seconds at 10 stops would save a substantial amount of time for anyone going some distance. It is possible that it would take longer to board at a consolidated stop as you suggested, but i am wondering if that is the case in practice, especially if stop consolidation has reduced the duration of trips on other lines. My experience is that it takes twice as long to go half the distance through the city as it does to get in to the city on bart. Reducing travel times by even 10 to 15 minutes on muni across the city would be great. By the way, are you dutch or otherwise have an interest in the netherlands? Hi chris- I do not interpret the sidewalk level bridge between the sidewalk and the transit boarding island as “riding on the sidewalk.” I can see how someone might see it that way, but do think it is different than riding on the sidewalk with the main flow of pedestrian traffic. People in a wheelchair or might otherwise have trouble going up or down the curbs need this bridge. You could potentially have curb cutouts instead, but the sidewalk level bridge can serve as a reminder to people on bicycles to slow down and watch for wheelchairs, older people, etc at that particular location. An able body person will be able to cross up and down across the bike lane without any problems. I do wish that the illustration showed the tables on one side of the sidewalk or the other. Weaving in and out of the tables or streetscape would be annoying. Miscalculation. For ex. it takes X seconds for passengers to board/exit, doors to open/close, pay fares at one stop. For two stops it takes 2X seconds. I wrote that when merging two stops into one, there will be twice as many passengers to board/exit, pay fares at this new stop, taking the same 2X seconds. Removing one stop means one less streetcar acceleration + deceleration, about 12 seconds. MTA still needs to show where to gain the left over 78 seconds. Why would the doors open and close twice 2x at one stop? Also, most people have clipper cards so the streetcar does not need to remain stopped to pay most fares. How have you determined that stopping and starting take only 12seconds each? No way does it take 45 seconds for a streetcar to slow down at a stop. MTA is consolidating two stops into one stop only at one location.They haven’t told us how they’ll save 90 seconds of travel time on 9 blocks. 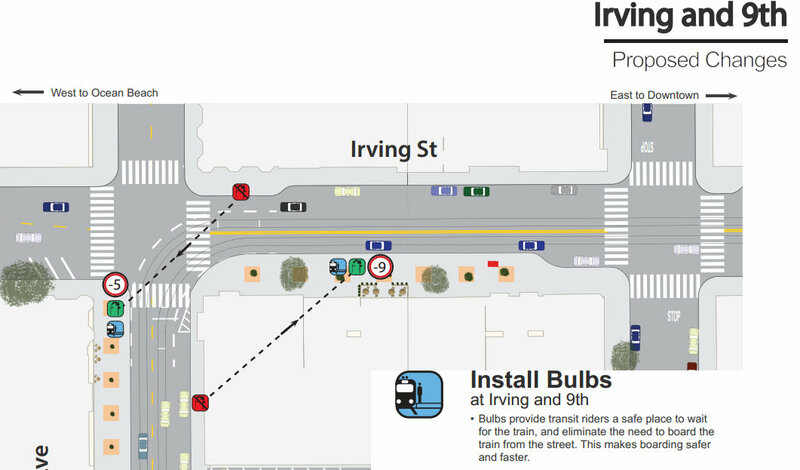 MTA is adding a traffic light where there is none. MTA doesn’t mention how much time will be saved along the entire route. They may increase travel time at another section. And overall increase travel time over the entire route. What does that help us? MTA has serious problems of being on time that should be looked at first.